In the lighting game for over a decade now, Fos Lighting could be your go-to place for offbeat lighting pieces and designs. With branches in many cities all over the country like Pune and Gurgaon, Fos lighting on Residency Road is different from the plethora of others in the area is the new and hipster twist they put on their designs. 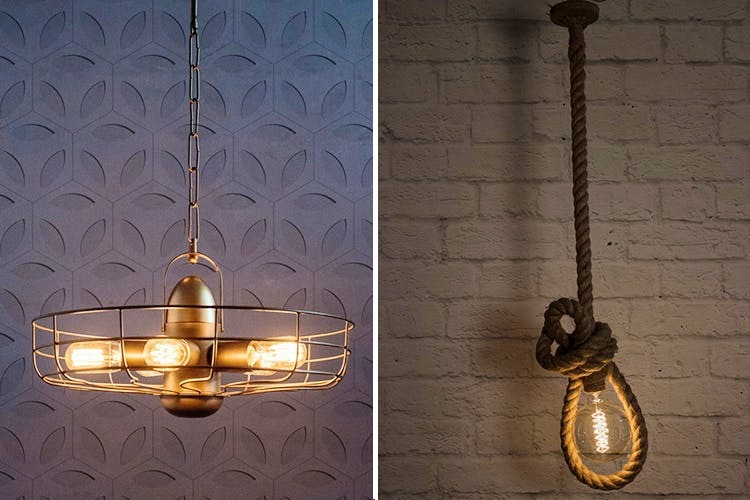 From Nautical Rustic pendant lights to a knotted rope light, their stuff is quirky and unconventional. Dealing with almost everything that falls under the umbrella of lighting, find everything from chandeliers to bathroom fixtures under their roof. We love their lattice floor lamps with intricate patterns on them and their old-school sconces that start at INR 900. If you love those DIY style bottle lamps but can’t be bothered to actually DIY, Fos has a few of those as well, that are more reliable and sturdy than what we could’ve come up with. If you’re one to keep it simple and classic, they have plenty of conventional lighting options to choose from. You can find the usual fare of simplistic table lamps and lanterns too with a few quirky designs throw into the mix. Apart from your regular CFL and LED bulbs, you can also find filament bulbs in many shapes and sizes that are sure to stand out with their warm fuzzy glow. So take the trip to Residency Road to give the place a quick look-see and maybe pick an item or two up. Wanna have a rough idea of what you’ll find there? Have a browse through their merch on their website and even place an order if you’re already convinced. If you do happen to be DIYing something and need a part or few you can also pick up spare parts and bulbs from here.